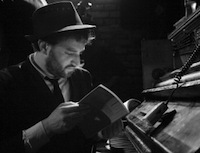 I'm not the first person to compare Daniel Kahn to Leonard Cohen or Brecht. And, in fact, this latest collection of poetry worth reading, set to music and played by an impeccable able band brings Jewish Punk Cabaret into the current year, includes Cohen's "Story of Isaac." Other songs are similarly mostly sad, depressed. The world is still unredeemed. True to form, other songs are old Yiddish songs from the archives—the opening, "A Meydl from Berlin." Kahn's own title song reflects on the changes since the fall of the Wall as ideology seems to be replaced by souvenir stands. He follows up with "The Old Songs" and delivers the coup de grace with a song from Heinrich Heine (set to music by Schumann! ), "The bad old songs." One could sense a theme. should be so great & heavy? & all of my woe. I am orphaned & homeless. & winter comes, the sky turns gray. & time is a bottle, emptied of win, with sorry everywhere. And, whether decrying a former friend turned zealot in Israel, or political discord elsewhere around the world, Kahn's music is ultimately a tonic, a declaration that we're not in this alone, but that we're also in the struggle because that's what we do. Not a bad bit of fun for the price of some plastic or an mp3 download. Take two and see you keeping the push for change alive. Pages copyright © 1995—2018 by Ari Davidow. All rights reserved. Last revised 30 July, 2013.